Sert it and ferggert it. That’s set and it forget it, MOM. She’s like, WHAT WENT WRONG AT CHILDBIRTH? So, do you guys have a dehydrator? I’m only 1,025% obsessed with mine. Get this, we found ours about a hundred years ago at a thrift store! It was like $.06 with no dead rats in it. SOLD. 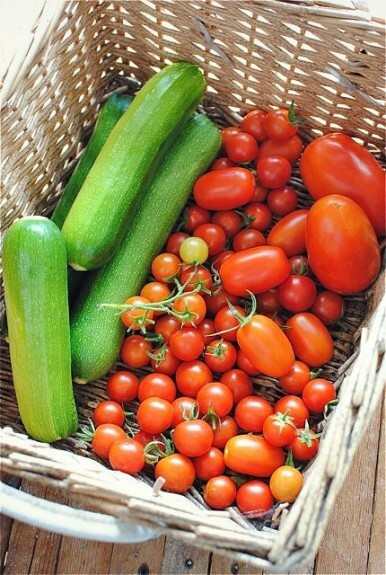 What you see in this basket is a complete joke compared to what’s going on in the garden now. I can’t keep up. And today is only the FIRST DAY OF SUMMER, haaayelp. So, we dehydrate. Just like my hair. The process is so simple you’re going to slap your knee and exclaim, “SAY!” all Mayberry-like. 5) Slice them in half. 6) Layer cut side up on the dehydration trays. 9) Turn the dehydrator on. 11) Live your life to the fullest over the next 24-36 hours. Wrinkle City! Just like my clothes. 1) They don’t need to be so brittle that they snap in half. You still want them a little flexible and chewy. 2) If you want to pack them in oil and garlic, that’s fine! I just get worried about botulism and chicken pox. 3) Don’t buy clothes that you have to iron if ironing makes you want to saw your hands off. OH BUT WAIT. It doesn’t stop here! Are you asking yourself, “but Beeeeev what do I doooo with theeeeesssseeee?” Guess what, pigeons. I have a few posts coming up showcasing the JOYS, FUN and PLEASURE of using dehydrated tomatoes in your meals. P.S. I have the oven version for drying yer ‘maters at the bottom of this here post. See, there’s a place for everyone on www.bevcooks.com! Now, what to do with the remaining 496 pounds of tomatoes on my counter. 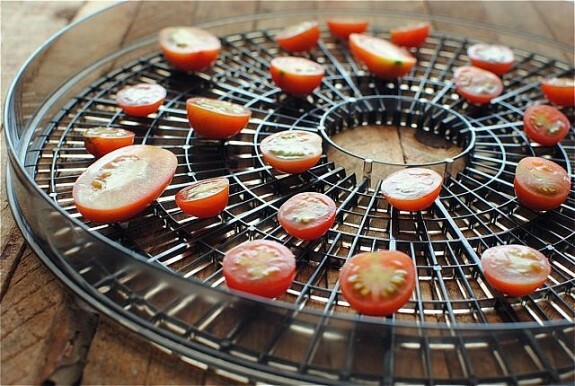 Seriously, you simply arrange the sliced tomato halves cut side up on each dehydrator tray. Lightly salt the tomatoes. Aaron held the racks over the sink while I did the sprinkling, to catch any salt though the cracks. And then he threw a ton over his shoulder because he thinks THAT’S THE RULE. Now, mine has a basic on/off switch, no settings, so I turned it on and left it alone for 24 hours. Check on them. The larger slices will probably need another 6-12 hours. They should be slightly flexible and not so brittle they’ll break. Just nice and dried. Store in a tightly sealed jar in the fridge or freezer or 6-9 months! You can of course add oil to it, but I get nervous about funky stuff appearing in it, so I keep mine as is. If you’re going the oven route, simply preheat your oven to 200, or the lowest setting. Arrange the tomatoes, cut side up, on a cake rack. Season with salt and bake for roughly 6-12 hours. You should be good to go! Did you dehydrate those zucchini too and what other veggies do you also dehydrate? I've not done the zucchini just yet, THIS year. But I sure plan on it, plus a lot of fruit that I'll post about! I have dried zucchini. It can be done in about 10-12 hours. They are crisp, light, and taste a bit nut-like. I like to take them with me as a snack with I go hiking in the mountains. They are light weight and have nutrients. I forgot about my last batch in the dehydrator 2-3 weeks ago. Are they still useable? They're dehydrated but didn't get put into a jar, are they poison now? You know, that's a good question! My husband says they're fine, since drying or dehydration is a way to preserve food. Maybe just dust them off? Ha! I just found out (after a year of using it) that my oven has a dehydrater function - happy day! - since the ole drying herbs on a cookie sheet on the counter trick didn't really work last year. So your post is great timing for me... except summer doesn't really start here in Seattle until the last day of summer. What kind of oven? we're oven shopping. Oven is totally up to you! I have a bosch and I dig it. Good luck on your oven search! Get a Bosch if you haven't already! I went through SEVEN "Made in America" ranges in SEVEN years!!! All brands and types. I now have a Bosch (probably actually made in the U.S. and Germany rather than Mexico or China) and it rocks. It has a dehydrate function and a proofing function. Awesome. Why is the concept of dried up and shriveled so appealing here??? But it is. It SO is. I just bought a dehydrator a couple of months ago. I've done strawberries and fruit leather. 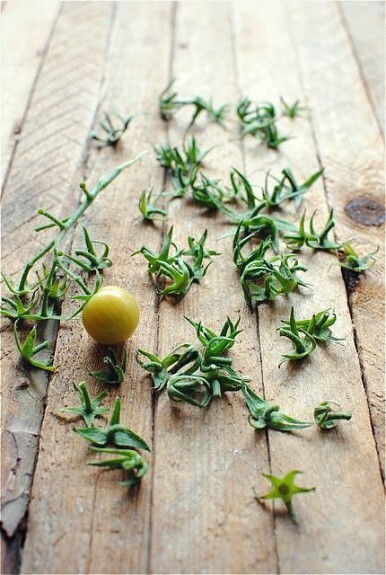 Can't wait to get started in earnest with tomatoes, herbs and other garden goodies! Thanks for your wisdom! Oh happy day!!! I'm on a garage sale/craig's list HUNT for a dehydrator. Too bad you don't live closer...I'd trade my children for some home grown tomatoes right about now!! Seriously..we've been too busy to get anything planted this year...SIGH!!! Guess i'll just drool over yours! Another reason to get a dehydrator! These look so good!! Definitely need a dehydrator. Gorgeous shots! I just loooove reading your posts. They play in my head and they sound just like you do in real life! I'm so glad I met you, otherwise, I'd be leaving a comment that said "yeah, somethin' did go amuck in childbirth. Get yo' head checked.' BUT, because I know ya & love ya, I laugh and choke on my edamame during lunch. I'm officially in the market for a dehydrator. Must be cheap, dead rats ok. Wait, it can be expensive & free of dead rats. That's more like it. There are about 37 things in this post that make me laugh. A lot. Oh and the tomatoes look hella tasty too :) Can't wait to see what you do with them there maters. Nice! I just recently bought a dehydrator and I have a ton of cherry tomatoes growing in the garden! beautiful! and I don't own an iron so most of my clothes get worn very wrinkly. These are so cute! Like little raisins. Only, you know, more like 'maters. xo. So, seriously, could you really not cook until 7 years ago...and now you are a brilliant chef, have your own garden, and know how dehydrate vegetables. You are truly amazing. I'm keeping my eyes sharp for a cheap dehydrator - those tomatoes are gorgeous. So pretty! Have you tried dehydrating anything else? I would love some suggestions! I have 2 new dehydrators. My old one was purchased at a yard sale, used and old. I used it for years until the trays got so brittle they broke on me. I just bought 2 new ones to take to South America with me when I retire next month. I make beef, turkey and chicken jerky with it for my husband, daughter and my dogs and cat. The jerky for my husband and daughter is marinated before dehydrating and the jerky for my dog and cat treats is plain meat. Everybody LOVES it and saves me so much money from buying the store bought stuff that you aren't sure what is really in it. If you get a dehydrator, you should try it if you like jerky meats. I use one for meats and the other for fruits and vegetables. I do these every year with Roma's and sprinkle on Italian or Pasta seasoning before turning on the dehydrator. Mmmmmm. And the smell is just incredible. i seriously need a dehydrator for tomatoes and figs. i do the oven-slow-roasted for our romas and then pack in oil in the fridge OR freeze them. they are INSANE on pizzas. and grilled cheese. and...a spoon. I just laughed so hard at this :). I've been holding out not getting a dehydrator because I have a hundred other kitchen gagets, but this has me thinking harder about it... I buy so many packages of dried sun dried tomatoes... this would probably save me so much money in the end. I LOVE tomatoes; but I've never dehydrated them. I think you just inspired me to do so! Thanks Bev; loved meeting you at BlogHer Food this month. Enjoy your summer! Okay I need to dehydrate ASAP! How fun! I didn't even know that it was so... doable! And btw, every time I hear the word "dehydrate" I think of Eddie, Chandler's crazy temporary roommate. YES. TOTALLY. I think of Eddie too! Ew. I have been dehydrating for years. Started out "Sun Drying", then my hubby made me a huge one and I used it for 25 years. It was completely worn out. So about 15 years ago I picked up the one I am using now. Let me tell you....You can dehydrate anything almost. Beef, chicken, wild game and fish jerky...all fruits, and all veggies. It is fun and you can make it a challenge. I love getting cabbage/carrots, and etc. to dehydrate..to add to the grandchildren's top roman. They love it and they are getting something good. Try it you will it. We tried applesauce and jello to jaz up the color. I just realize how much I like snacking on dehydrated tomatoes a few months ago. I can't wait to pick them from the garden and dehydrate them! Yum. I dehydrate almost everything (in addition to canning and freezing, depending on what I will use the veggies for). Corn, green beans, onion, celery, carrots and mushrooms are especially good in soups in the winter! Tomatoes are good for snacking (I use a variety of sprinkles, including season salt with my own dried hot pepper flakes for a bit of punch, and lemon salt) YUMMY!!!! 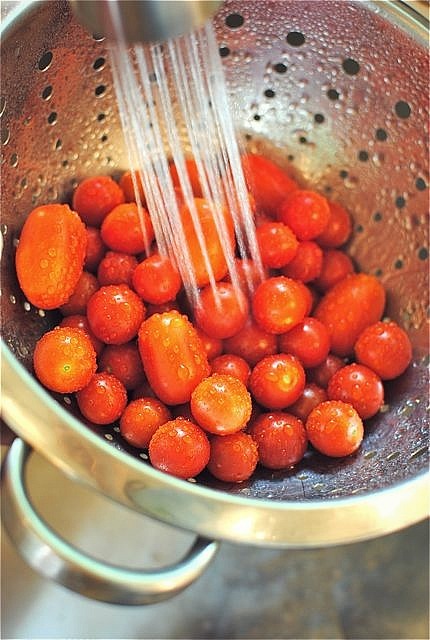 Could you share recipes that use dehydrated tomatoes? If they're dehydrated, you ought to be able to keep your tomatoes (and other foods) in the cupboard, not the fridge or freezer. Dehydration is one of my favorite methods of preservation, as I live in an area so dry that I don't really even need a dehydrator. I've done zucchini, bananas, berries (strawberries, raspberries, blueberries--you name it! ), tomatoes, corn, apples, carrots, peas, onions--all sorts of good stuff! My sweetie loves the bananas--so much more flavorful than the store-bought ones. 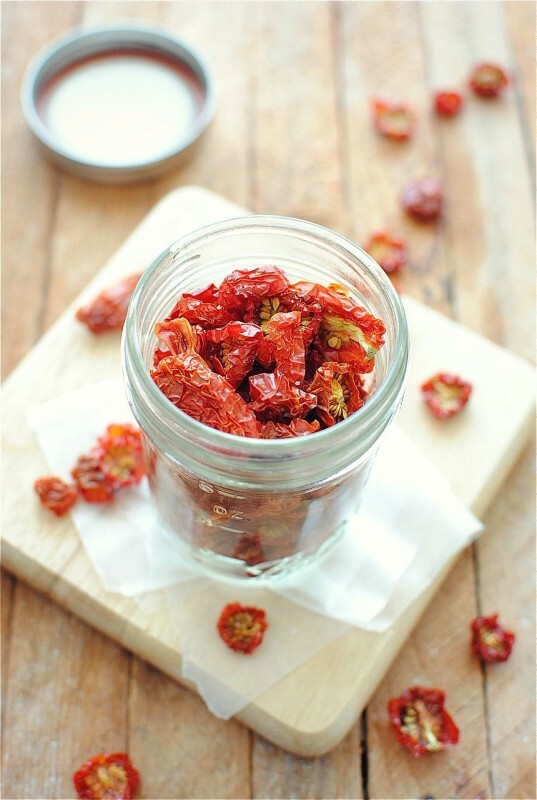 After dehydrating cherry tomatoes are they safe to store in the pantry, or do they have to be frozen? These look great. Just posted the photo along with your website URL on my Facebook page. I am taking a break for a bit and smiled at today’s post! Hope you don’t mind my adding my info. I oven dry my tomatoes. I have way too many for the dehydrator and many years ago I started doing it in the oven at about 275 degrees. We live on a farm in Kansas USA. Today it is about 104 and we are in a severe drought. I am on my 3rd batch of drying this year. I line 4 large sheet pans with parchment paper and slice Roma tomatoes length wise and cram the trays very tightly. Some tomatoes are smaller so I try to keep like sizes on the same tray. I don't add oil or salt. When they are fairly tightened up, I let the trays cool a bit and then loosen each tomato, then put the tray in the freezer for about half an hour before bagging. This keeps them loose in the bag. We freeze them to keep them fresh. They taste wonderful chopped a bit and tossed with some basil (which I freeze fresh in a bag) and put in some scrambled eggs. Also, great with some pasta. I am taking a break for a bit and was smiled at today’s post! Hope you don’t mind my adding my info. I oven dry my tomatoes. I have way too many for the dehydrator and many years ago I started doing it in the oven at about 275 degrees. We live on a farm in Kansas USA. Today it is about 104 and we are in a severe drought. I am on my 3rd batch of drying this year. I line 4 large sheet pans with parchment paper and slice Roma tomatoes length wise and cram the trays very tightly. Some tomatoes are smaller so I try to keep like sizes on the same tray. I don't add oil or salt. When they are fairly tightened up, I let the trays cool a bit and then loosen each tomato, then put the tray in the freezer for about half an hour before bagging. This keeps them loose in the bag. We freeze them to keep them fresh. They taste wonderful chopped a bit and tossed with some basil (which I freeze fresh in a bag) and put in some scrambled eggs. Also, great with some pasta. I have tomato plants that are so thick I can't get through them to harvest all of the tomatoes. I am so glad I found a way to dehydrate them. Canning them with a pressure canner is way more than I can wrap myself around this year. I have been making my dogs' chicken jerky ever since the Chinese dog chicken jerky started killing dogs. 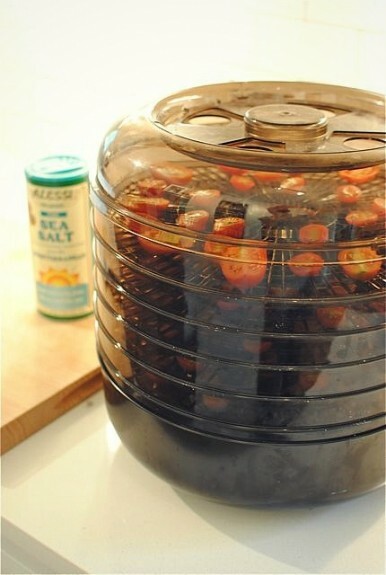 It is so easy and I Love my dehydrator. I am going to start on my tomatoes right now!! Is there a way to dehydrate them so they don't have to be kept in the freezer? Do you have to use salt, i dehydrated tomatoes with no salt and put in mason jars. I think it's personal preference! We salt them for a little flavor, but it's not too necessary. I do that with the store bought Roma tomatoes. I sprinkle a little salt and Italian seasoning. 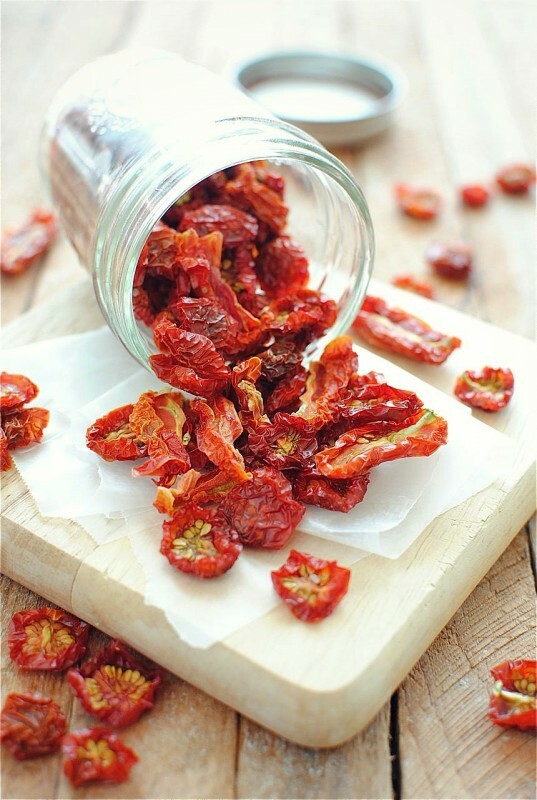 Makes wonderful sun dried tomatoes for recipes :) I cut the Roma maters in quarters. Works wonderfully. 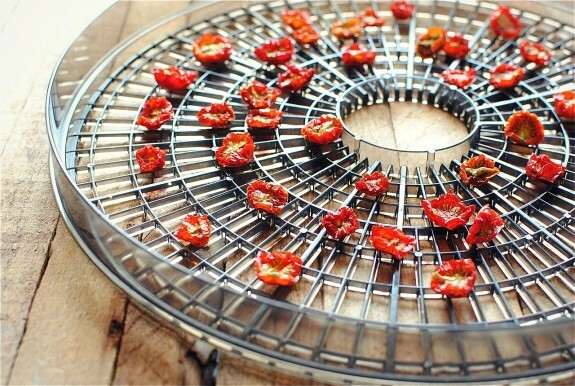 I started drying tomatoes last summer in the same dehydrator as in your photo. I had planned on grinding them up and using them for seasoning but they became an addictive snack. I also dried zucchini chips last year. I stored them in mason jars. I have not salted anything I've dried but I'll try that this summer. I plan on drying tomatoes, zucchini and onions and maybe garlic and grinding them in the food processor to make a seasoning powder. I am shopping for an oven and maybe a warming drawer. I have heard that you can dehydrate in a warming drawer, does anyone have experience with that? Wow, I have the same dehydrator you do. Its an ooooold one my grandmother gave me. I didnt think anyone else had one like it. lol. I dehydrate tomatoes and then crush them in a coffee grinder for using as tomato paste. I store the tomato powder in a glass jar and then when I need paste, I just add a little bit of water to it. Awesome! I recently bought a dehydrator and so looking forward to doing this! Thank you for some other excellent article. The place else could anybody get that kind of info in such a perfect approach of writing? I have a presentation subsequent week, and I'm on the look for such info. It∞∂s actually a cool and useful piece of information. I am happy that you simply shared this helpful info with us. Please keep us up to date like this. Thank you for sharing. magnificent put up, very informative. I ponder why the opposite experts of this sector don't notice this. You must proceed your writing. I'm confident, you've a huge readers' base already! Hello there I am so happy I found your site, I really found you by mistake, while I was searching on Askjeeve for something else, Nonetheless I am here now and would just like to say thanks for a incredible post and a all round enjoyable blog (I also love the theme/design), I don't have time to browse it all at the moment but I have saved it and also included your RSS feeds, so when I have time I will be back to read more, Please do keep up the awesome job. I Googled "dehydrate tomatoes" and ended up here - so glad I did! Look forward to getting to know you. i didnt go through all of the comments, so the answer may have been posted all ready, but how long do the tomatoes last once they are dehydrated? Can you dry different items at the same time ...... say, tomatoes and bananas? Or will the bananas taste like tomatoes? Bought my dehydrator 6 months ago and love it. I dehydrate most everything. Ground hamburger comes out great and can be used in chili, pasta sauce, tacos and soups it is awesome. When dry put in jars and place in cupboard. My dehydrator is in use almost constantly. It is easy and affordable. The mixed fruit comes out just great. I advise everyone to get one! Ha! You are a hoot! Enjoyed the chuckles while I learned how to dehydrate my tomatoes! Thank you!!! You just convinced me to use my dehydrator! Which was a husband bought item and has never been used (along with the toaster oven and pasta maker... whyyyy does he do that). I love your humor! Thanks for finally talking about >Dehydrating Tomatoes 101: - Bev Cooks <Loved it! Tausende Single Frauen und lusthungrige Muschis, die auf der Suche nach einem wilden Seitensprung sind, suchen hier täglich nach einem prickelnden Livedate Partner. I have a question after I dehydrate the tomatoes can I pack them in canning jars and place them back in my dehydrator to seal with out having to store in fridge? CAN I PUT OXYGEN ABSORBERS IN JARS AND JUST PUT THEM ON MY PANTRY SHELVES INSTEAD OF IN FRIDGE OR FREEZER? THANKS SO MUCH !!!! I'm not sure what oxygen absorbers are, but I'm sure it's fine! Good luck! The Bitcoin Code Review Bitcoin Automated Trading Software - April 11, 2018 http://autopostunlimitedgroups.com/500plus.html I saw this really great post today.